Upon reading the blurb for Sharon Lynn Fisher's sci-fi romanceECHO 8, I was struck by how many different elements it promised readers--especially women readers. The story has science fiction and romance, to be sure, but there are hints that other genre elements have been mixed in. This is at odds with the conception that women are averse to genres like action-adventure, SF, or any other genres typically coded as masculine. I decided to do an informal analysis of the blurb's word choices and structure to tease out the various types of story action readers can expect from ECHO 8. My fancy pants visuals are a bit small, so please enlarge your screen as necessary. Clearly, a blurb can serve multiple purposes. In the case of ECHO 8, it describes the science fiction romance aspect of the story without using that exact label. Paranormal was possibly included not only because of the story content, but also because of its strong association with the well-known "paranormal romance." The blurb plainly telegraphs the romance plot. 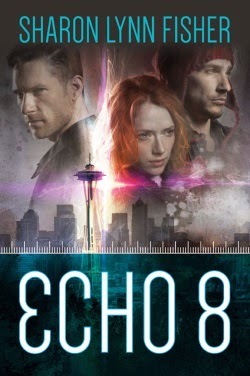 But it also communicates that ECHO 8 includes danger, action-adventure, strange phenomena, a mystery, thriller/police procedural elements, and scientific experiments. Some of those are genres and elements that weren't marketed to women for a long time, and still aren't in many cases. But now, women authors fold such elements into genres like sci-fi romance because it's a great way to serve under-served readers. And blurbs like the one for ECHO 8 code the hybrid nature of SFR in interesting, yet very strategic ways.